Two record streaks came to an end last night. The Kansas City Royals were enjoying the longest winning streak in postseason history (eight games) when they ran into the human buzz saw that is Madison Bumgarner. The San Francisco Giants' ace was enjoying a streak of his own, one which came to the end when Salvador Perez's homer plated the first postseason run against Bumgarner in 21 innings. Perez notwithstanding, it was never really much of a contest, the eventual winning run having crossed before Bumgarner even took the mound. The Royals lost their first World Series game in 29 years by a 7-1 drubbing, sending the Giants to the top of the heap for the first time this October according to the Rational Pastime model. The Giants' new 67% advantage (a high for them and anyone else this October) was boosted by their decisive win at Kansas City, which raised their Power Score by ~.004 and cost the Royals the same. 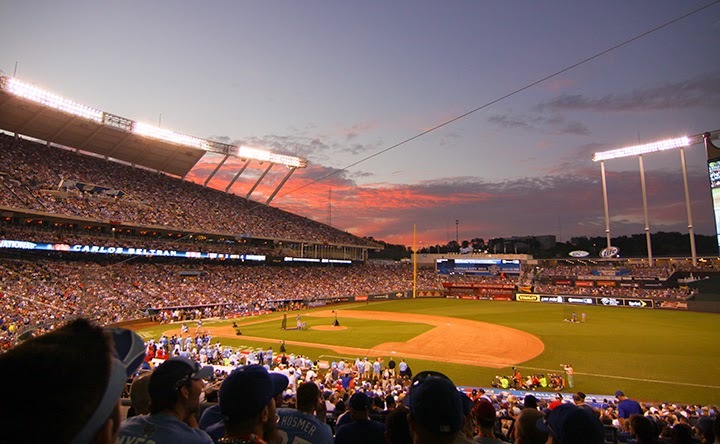 By losing at home, the Royals also blew their home field advantage. With a possible three games remaining at both parks and the Giants up 1-0, it is now officially a level playing field. The modal outcome is now a Giants win at home in five, followed by a Giants win on the road in six. The Royals best bet is, as it was yesterday, to force a Game 7 and win it at home. 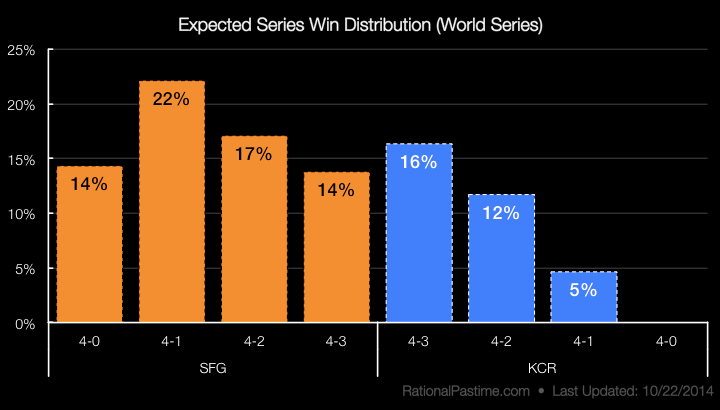 There is a 14% chance that San Francisco will win out and sweep the Kansas City Royals for their third Commissioner's Trophy in five years. 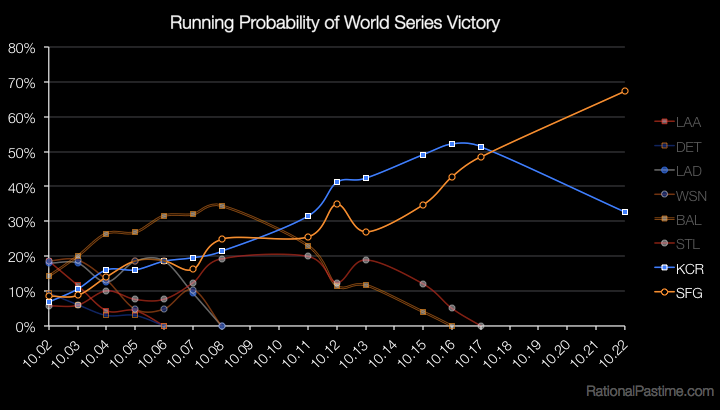 Check back tomorrow to see if the Royals will take the WS% lead back in a 1-1 series, or if the Giants will build a dominant probability advantage up 2-0.